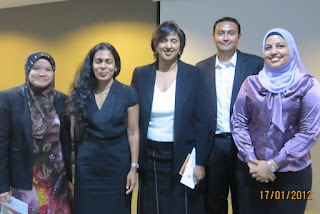 "Meera Samanther from Messrs Kang & Kang, Preetha Pillai from Messrs Skrine & Co and Nahzatul Ain bte Mohd Khalid from Messrs Khalid, Iqbal & Associates presented the Forum held at the KL Bar Auditorium at 7.30pm. 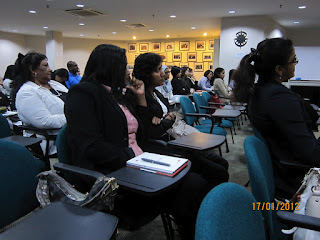 The forum was attended by 36 participants. 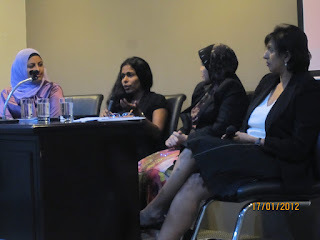 The forum covered various areas from the challenges a woman lawyer faces in the legal fraternity to excelling within the ambits of the profession. 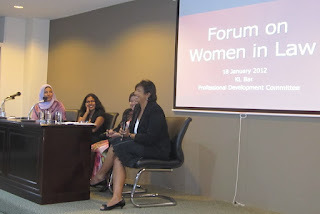 Real time experiences and knowledge were shared by the speakers who themselves have dealt with various challenges and succeeded in the profession."